Winter is here, and while it might not get as frigid here in Titusville as elsewhere in the country, that doesn’t mean we don’t have our share of chilly nights. While your heater is getting some extra work this season, your energy bills will start to rise. With that in mind, we’ve put together a list of some of the ways you can save on your energy bills while staying comfy this winter. Need HVAC service in Titusville? Call Altman’s Cooling & Heating today to schedule your appointment with one of our experienced HVAC professionals. Your air filters are the main line of defense for your HVAC system. They catch the dirt, dust, and other air particles that float through your house, preventing them from entering your system. However, over time your filter will become clogged by these particles. 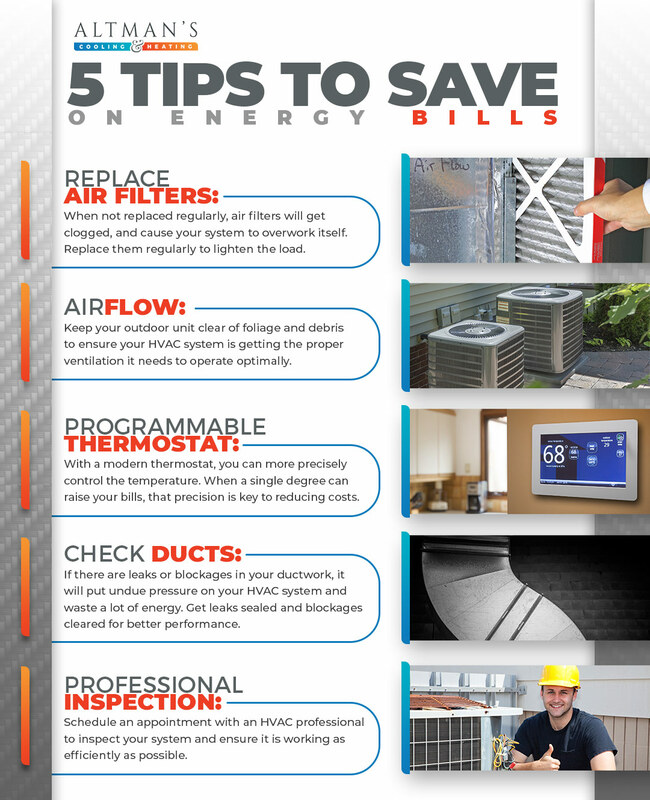 Not only will this cause some of them to be recirculated into your air supply, negatively impacting your home’s indoor air quality, but it will also cause your HVAC system to work harder than necessary. That is because a clogged air filter will strain the airflow and ventilation an HVAC system needs to operate properly. Check the manufacturer recommendations for how often your air filters should be replaced or cleaned for the best results. Your HVAC system worries don’t start and end inside your home. It’s vital you check the outside portion of your system to ensure it is working properly. Keep foliage at least three feet away from the outdoor unit to provide proper room for airflow. Additionally, it’s important to keep debris off of the system. Be sure you regularly clean your gutters as well to ensure moisture doesn’t build up and affect your indoor air quality. Old style thermostats are imprecise and finicky. When a single degree can have a huge impact on your energy bill, these just won’t cut it anymore. With a programmable thermostat, you can set it to a specific temperature, put it on a schedule so it isn’t running when no one is home, and even turn it off remotely if you forget when you go out of town for the holidays. You might not think about your home’s ductwork that often, but if they are leaking or obstructed, it can lead to higher energy bills and an expensive HVAC system replacement down the line. In fact, leaking ductwork can result in the loss of as much as 35 percent of the airflow your HVAC system produces. Ensure all leaks are properly sealed and there are no obstructions blocking airflow. You’re likely not an expert when it comes to how HVAC systems work, and that’s ok! That’s why HVAC professionals like Altman’s Heating and Cooling of Titusville are here to help. Call today to schedule an inspection to make sure your HVAC system is working properly, any repairs are made before they cause damage, and advise you on more energy saving tips and tricks.